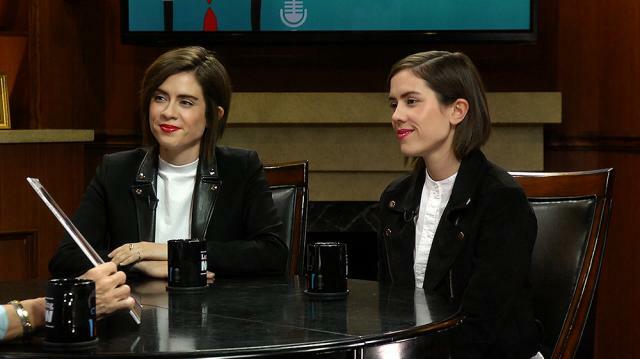 Musical duo Tegan and Sara – who are longtime advocates of gay rights – explain why they themselves don’t want to get married. Larry King: Do you want to get married? Sara Quin: I do not want to get married. Tegan Quin: I believe that the rights that come along with marriage are important and may apply to us both, although we're resistant to it, because we have American partners. But I don't like the idea of a wedding. I feel it's very, the part of me that wants to fight against a certain path. Sara Quin: It feels conforming to a very, sort of, to me, a very traditional and old fashioned ideal. Tegan Quin: But I'm happy to continue to push and fight for that around the world for all people. Larry King: So you wouldn't want to raise a child? Sara Quin: Oh, I would have children. And I think common law, you know, status, is totally valid. My mother and her partner were together for over 13 years raising us, and they never felt the need to get married. And we always saw our mom's partner as our step-dad, we didn't, we didn't need them to have a wedding for us to see their connection they had.